Born at Fort Bragg, NC in ‘24, Vernon “Lucky” Wray is the much lesser known but no less talented older brother of the original Shawnee rocker Link Wray of “Rumble” fame. Having learned to play guitar by the age of 11, Vernon played rhythm guitar and bass behind Link for the better part of Link’s career. Vernon was a tortured innovator. He ran one of the country’s first DIY record labels called Rumble Records named after the family hit in 1958, and was host to an American Bandstand knock-off out of DC called “The Milt Grant Show”. Around this time Vernon acting as manager and producer of the Ray Men, decided to set up a family recording studio, which had a number of temporary homes that included the family grocery store before coming to a temporary rest in a ramshackle shed on the family property in Accokeek, Maryland where it was famously dubbed Wray’s Shack 3 Tracks. This humble set-up produced a genuine musical treasure trove which included the classic Ray Men cuts on the Swan imprint, the spectacular Link Wray LP as well as a bevy of recordings from other local musicians. Despite his success, life on the east coast was just a bit too hectic for Vernon. In the spring of ‘72 he packed up the back wall of the recording shack and high-tailed it to Tuscon, AZ to “mellow out”. 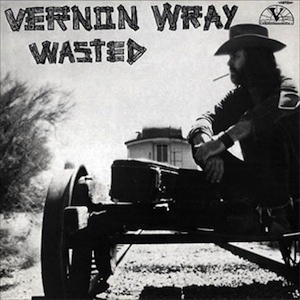 In Tuscon he rebuilt the recording studio renaming it Vernon Wray’s Record Factory after upgrading it to eight tracks from three. It was here that Vernon was able to put to tape his much mellower solo work released in two batches as “Superstar at My House” and “Wasted”. The former being released exclusively on cassette and 8-track tape, and the latter by Vermillion Records on vinyl in a run of about 400 copies sold only at shows in Tuscon. Both albums are extremely rare and prized. Prized for good reason. Wasted, released in ‘72 is rare in more ways than just its limited availability — as a lost classic it’s pure gold. Laced throughout with the sparkling guitar work of his brother Link, the tasteful drumming of his other brother Doug, Vernon’s understated piano and a host of interesting stereo production effects, the album has a lot to offer musically. More countrified in its spirit and laid-back in tone than his earlier work with his brother at the front, “Wasted” is lyrically lonely and heartfelt while managing to not become mired in depression. On songs like “Facing All the Same Tomorrows” and “Prison Song” Vernon’s smooth honey voice is balm to the world weariness that he speaks to. The heavy themes Vernon sings about are at the same time personal and universal as exemplified by the cut “Faces in the Crowd” in which Vernon confronts the isolation that he must have felt in the cities of the East coast and offers the hope of a salvation tendered by “Mother Nature out West”, as embodied by the lively flute playing in the background. Even though there is a common thread of world weariness throughout, not all of it is expressed in a heavy musical manner. Vernon romps through the swampy floor stomper “Tailpipe” in which he likens the effect of his latest romance on his person to a dilapidated car — you can decipher the analogy in the title. The relatively upbeat country bar-room “tear in my beer” vibe of “When I Start Drinking” has just the right amount of twangy drunken camaraderie to make you smile. thanks a lot for that. you seem to be nice people.